This modern Memories of Tuscany tapestry is form the work of Tandi Venter. This modern artist who lives in Denver, Colorado. In her own words, "My artwork has evolved over time in my own search for modern simplicity that lends itself to clean, contemporary spaces." Here in this piece which is a signature work of her landsacpe works, we see a Tuscan landscape of poplar trees and the golden fields and hints of mountain in the afternoon sun which is bright in the background, to cast shadows. The illustrative yet abstract quality of the work is ingenious in that it evokes memories and emotions. 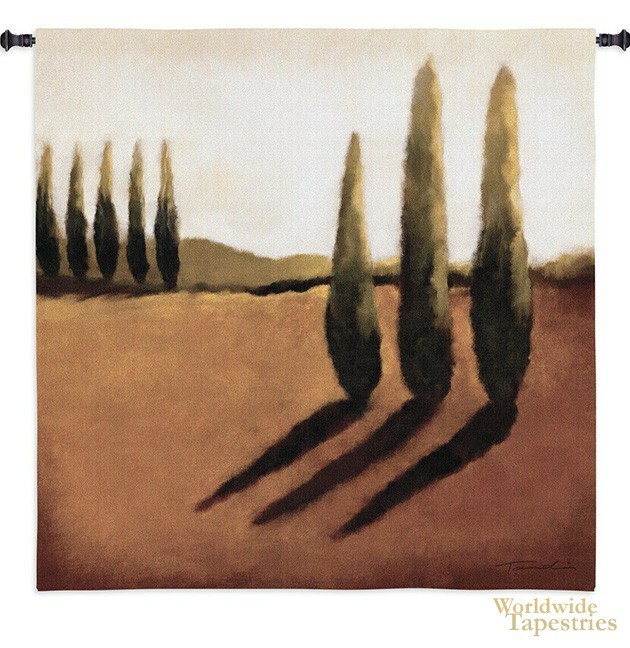 This modern Tuscan landscape art "Memories of Tuscany" tapestry is backed with a lining and has a tunnel for easy hanging. Note: tapestry rod and tassels, where pictured, are purchased separately.